Recently I have been speaking to a range of audiences about how social media technologies and practices can be used inside an organisation. The use of social media inside an organisation is more commonly being referred to as social business. In many of the workshops I have lead lately, one of the most common discussion points has been what about the people in our organisation that will never tweet or blog. The question is always asked, how can we enlist them using social inside the company? Until recently, it has all been about social media – Twitter, Facebook and the like. Those early adopters such as myself (on Twitter since 2007, using LinkedIn and blogging since 2004) find themselves completely comfortable sharing their every thought and movements, to the bemusement of those that find this a totally foreign practice. The online influence industry, while still in its infancy is dominated by platforms such as Kred (where I am CEO), and Klout. As well as finding real online influencers, a culture of those who try and game these platforms and become “more influential” has also sprung up. I wrote recently about how to spot a social media faker. In my role, I see first-hand those who think they are influential try and convince brands of the same. Only when you have actually become an influencer (accidentally in my case) can you really understand how online influence actually works. While platforms such as Kred can help you find people to connect with and promote your product or service, we may be missing a trick. 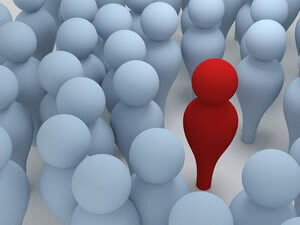 Inside every organisation is an army of influencers, subject matter experts and “go to” people all waiting to be found, that can help us with our day-day jobs, and in turn provide better experiences for our customers. I remember when I worked at the largest telecommunications company in Australia, Telstra in the late 90s, there were over 54,000 staff (now around 36,000). The internal directory did not list the expertise of staff members, so it was always a case of being well networked internally to get your job done and find the right people. Amazingly, when I was working on an online portal opportunity for small businesses at the telco, I discovered through my networks that there were 6 such initiatives being run at the same time. Needless to say I was quick to convene a meeting (in a small room with no chairs so we all had to stand), where those assembled agreed to work on just one small business portal. Had I been able to use a tool to find all of the small business people in the organisation, I could have saved weeks of effort. Social business takes over from social media when we use the same techniques and technologies used in a very public way, and bring those inside an organisation. Where publicly I tweet, internally I might use Yammer, Chatter, or a product from IBM called Connections. These internal social networks are secure in that you cannot see what is being said outside the organisation. The question is how do we get people to use them when they are not natural users of social media? Ginni Rometty, the CEO of IBM gave a presentation recently to the Council on Foreign Relations where described how in the future, IBM might pay a bonus based on how well you share information with your co-workers, and how your customers and partners rate you as well. At the same event, she also talked about how today’s workers now have a secret weapon, to be used in conjunction with the “big data” that everyone talks about. Today’s workers now have access to each other. “You might have forgotten this: Peter Drucker coined the word “knowledge worker.” It was actually 1959 – 1959, so I was a little toddler at this time. Now, non-routine work – but what’s changed? Obviously, I said tons of data. The tools are different today than they were then. Billions of different interfaces. But today’s knowledge workers have access to something around the clock: The have access to each other. Ginni has really hit on one of the key benefits of social business – allowing those inside an enterprise to use the same tools and techniques we use when networking socially, to network internally. At a recent conference in London, I was speaking on a panel about the next stage of social media. A question from the audience asked what metrics can be used to look at the adoption of social media inside an organisation. My response, shown below explained how Ogilvy in London used gamification techniques to encourage their staff to get more involved with social. In summary – make social inside an organisation fun and inclusive and then people are more likely to use it. Isn’t this just spying on our employees? Those more concerned about data sharing and privacy may not be entirely comfortable with the notion of sharing at work. I see it differently though. Imagine there has been a safety issue identified at your company that makes children’s toys. Instantly, horrified mummy bloggers hit social media condemning your company for selling unsafe toys and demanding that your CEO resigns. Just as quickly, your internal networks swing into action, and those from R&D through to customer service and even HR chime in with what they are hearing, along with possible solutions from subject matter experts, and then the facts emerge quickly that it is a minor fault that can be easily fixed thanks to the collaboration happening in real-time with people from across the company. As a result of the great feedback, the product development department work on a solution, and then share exactly what is being done to fix the fault, and everyone is kept informed. In this scenario, those people managing the company’s Twitter and Facebook pages as well as those on the end of the phone to outraged mothers are able to quickly distribute the facts, and a crisis is averted. What happens next is those mummy bloggers turn from being outraged, into strong advocates because your company dealt with this issue in real time, were transparent and got the message out quickly. In the same scenario, applied to the way many companies operate today, the whole company might be waiting for the PR department to release a statement, and those within the company able to provide specialist advice might be overlooked as the situation unfolds. So in the future, when we talk about influencers, don’t forget those in your own organisation, which if armed with the same tools that help make ordinary people into influencers online, could be your greatest asset inside your organisation.